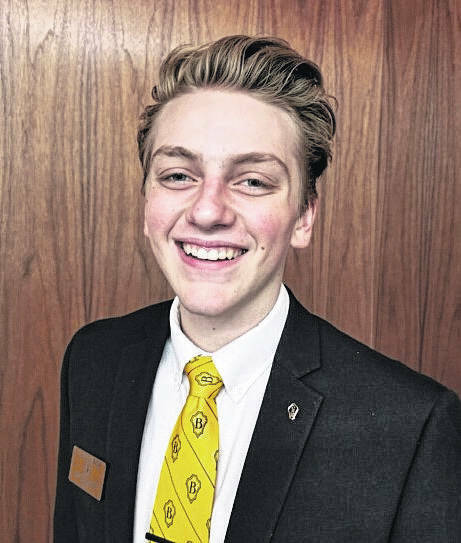 Ian Eblin, a River Valley student, has been selected as a regional leadership representative in a new program within the Beta Club, with hopes to excel at the national level. BIDWELL — One River Valley student is setting the course for future students to serve in the community and at the national level. Through Beta Club and the Ohio State Convention, Ian Eblin was selected for the position of regional leadership representative, a new program that Beta is piloting to promote the four characteristics of Beta: character, leadership, achievement, and service. If selected for the role at the national level, the responsibility and weight will greatly increase for Eblin. He will be responsible as a liaison to the local clubs and area from the national level, assisting with other clubs and conventions. The position also comes with training, to further him as a leader. Eblin will attend a leadership summit in Washington D.C., the cost of which is completely paid. In order to be chosen, he had to volunteer time and effort at the state convention, where he served and went through a selection process. “They monitored Ian at convention, they are seeking students who exemplify the characteristics of Beta; character, service, leadership, and achievement. They look at how they serve and lead the club and there is also a lengthy interview process where they want to get to know the candidate on a more personal level,” said Walker. Eblin is excited for the chance to continue to learn how to lead, participate in a new program, and represent his fellow students well on the national level.